This historic name is of Anglo-Saxon origin, and is a locational surname from the city of Wakefield in West Yorkshire, and perhaps also from a place of the same name in Northamptonshire, near Stony Stratford. 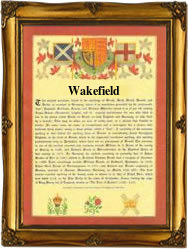 The place in Yorkshire is recorded as "Wachefeld" in the Domesday Book of 1086, and as "Wakefeld" in the 1219 Feet of Fines, while the place in Northamptonshire appears as "Wacafeld" in the Domesday Book. Both placenames share the same meaning and derivation, which is "the festival field", derived from the Olde English pre 7th Century "wacu", vigil, festival, wake, with "feld", pasture, open country. The name was thus "patch of open land where a fair was held, or where wake-plays were given". This name is particularly relevant to Wakefield in Yorkshire, the home of the famous Towneley Plays, one of the four extant groups of medieval Mystery Plays surviving. Early forms of the surname from the Yorkshire Poll Tax Returns of 1379 include: Johannes de Wakfeld; Willelmus Waykfeld; and Thomas Wakefeld. Edward Gibbon Wakefield (1796 - 1862) is well known as one of the founders of New Zealand. The first recorded spelling of the family name is shown to be that of Thomas de Wakefeld, which was dated 1292, in the "Records of Pleas before the King", during the reign of Edward 1, known as "The Hammer of the Scots", 1272 - 1307. Surnames became necessary when governments introduced personal taxation. In England this was known as Poll Tax. Throughout the centuries, surnames in every country have continued to "develop" often leading to astonishing variants of the original spelling.